What's in your wallet? If it's an American Express card and you're on your way to Costco, you may want to turn around and head for Walmart or Target. This is the day that Costco dumps Amex for Visa. Costco and Amex spent 16 good years together but, as sometimes happens with relationships, it just sort of fizzled out over time. And now, just as when humans split the blanket, the rest of us are left to deal with the fall-out. Costco members who previously had a Costco-issued American Express card should by now have received a new Costco/Citi Visa card in the mail -- officially called the Costco Anywhere Visa card. Those who have been using a non-Costco Amex? Well, they're out of luck. The only credit card being accepted at Costco today is Visa. It doesn't have to be from Citi, but it must be a Visa. Debit cards are OK, whether they're Mastercard or Visa. Costco cash cards are also OK, as are checks, cash, and EBT. But not the spurned American Express. Costco has, in effect, taken out a restraining order barring Amex cards from its check-out lanes. 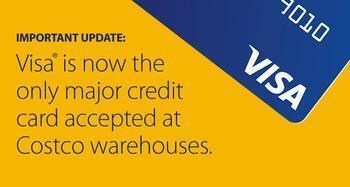 Costco advises customers left in the lurch to apply for the Citi Visa. If that includes you, you can do so at Costco.com, or by calling 1-800-324-3098. Starting today, Costco begins accepting all Visa credit cards, including the new Costco Anywhere Visa® Card by Citi, both in the warehouse and at Costco gas stations. American Express® cards will no longer be accepted. Short and sweet. Anyone who didn't happen onto the news through news reports or dumb luck might well be taken by surprise. Costco is notoriously stingy with information and has nothing at all in its press section about today's changeover other than glowing projections aimed at investors. Some longtime Costco customers have vowed to go elsewhere, saying they simply don't want to give up their existing credit cards. "I'm a small business person and my American Express card is the only one I ever use for business expenses. I'll be damned if I'll take on the bother and risk of another card just to keep Costco happy," said an internet entrepreneur who said he had been a Costco member for "decades" but said he would cancel his Costco membership and do more of his business-related shopping at Amazon. Other consumers upset about the change include a consumer named Robert, who emailed us about it today. "I have closed my Costco account and just spent over an hour on the phone canceling my Citi Bank Visa card," Robert said. "This will now impact my credit rating for closing both the new Visa and American Express Card. (American Express representative told me months ago that they would be closing my current AMX/Costco card and I would get a new AMX card. It now turns out, that is not true)." We asked Robert why he didn't keep the Visa card. "I did not want another Visa card, especially from Citi Bank. I wanted my Amex card, with or without Costco. I had my Amex card long before it was tied to Costco," he said. "Mostly, I don't care for anyone deciding for me which credit cards I'll possess." Glen of Fairfield, Calif., is unhappy with his new Citi card because it carries the RFID symbol, four wavy lines meant to symbolize radio waves. "It's an indicator that this card is capable of transmitting your card's data 24/7. All it takes is some creep, with the right equipment, to copy your card's data and cause you credit problems for years to come," Glen said in a ConsumerAffairs review. "I'm not fond of anything that is actively transmitting my info and I think it's unfair that I must buy or provide a protective sleeve or 'special' wallet to prevent the capture of my data." RFID cards are not all that unusual. An industry newsletter, the Nilson Report, estimates there are 35 million chip cards in circulation in the U.S. All three major U.S. credit card companies issue them, although the technology is more widely used by transit agencies to provide quick service at subway entrances. The technology is also becoming popular for security applications -- ID cards that admit their users to selected secure areas, for example. How vulnerable the cards are to fraud depends on who you ask. 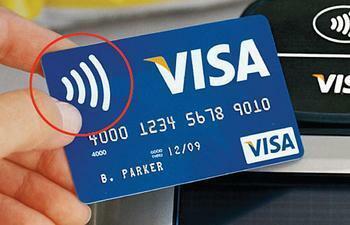 Consumer Reports warned back in 2011 that the information on your card could be used to make unauthorized purchases and said that the equipment needed to intercept RFID transmission was readily available for less than $100. The advantage of RFID cards is that they are "contactless," meaning you don't have to swipe or insert your card in a reader, assuming you're at one of the few retailer locations using the technology. They're used mostly by retailers with lots of low-amount sales -- newsstands, coffee shops, and so forth, where customers tend to be in a hurry.